There is an entirely different look and feel to Paris when seen at night. While I have shared where to get some great views of Paris from different vantage points (Getting Different Views), these were for daytime shots. 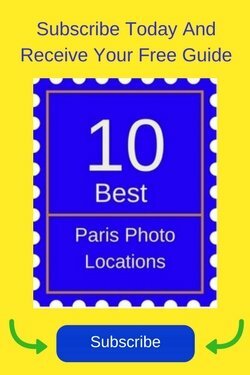 I’m sure they’re fine at night too, however, I HIGHLY recommend you visit these locations at night to not only enjoy Paris when it is quieter (fewer crowds), but also to get some interesting shots. 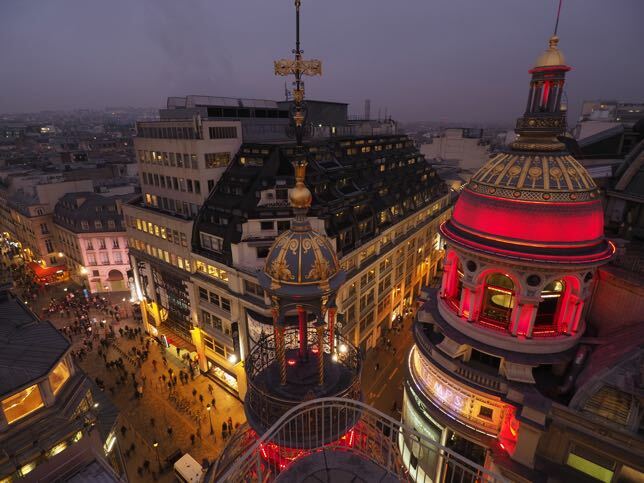 I LOVE the pictures I got from the top of Printemps, which is one of the big department stores on Boulevard Haussmann. 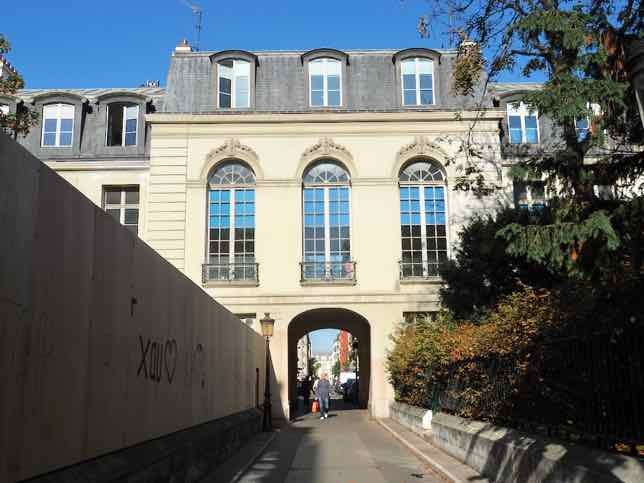 It’s down the street from Galeries Lafayette. Access to the top is free and the views are great. Go to the top floor where there is a restaurant. There is a fairly large terrace where you can take pictures. When you walk along the Seine you will see so many famous places including Cathedral Notre Dame, the Conciergerie and of course the iconic bridges. 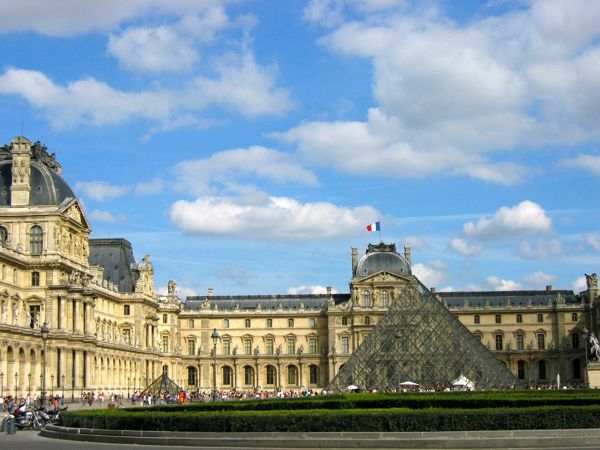 Seeing the inside of the Louvre Museum is interesting in itself at night and definitely worth a visit, but seeing the pyramid by I.M. Pei in the main courtyard is especially nice at night. 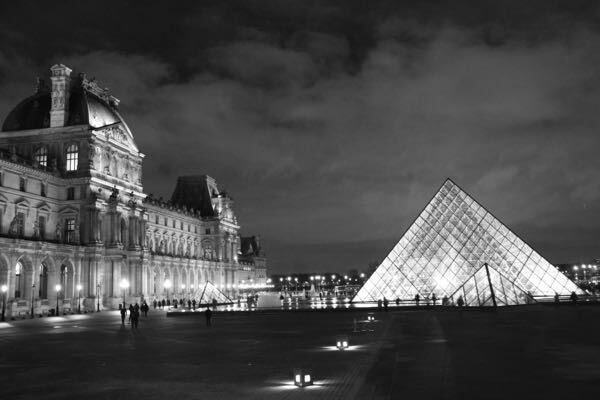 The Louvre building and the 3 pyramids surrounding the larger pyramid are well lit. 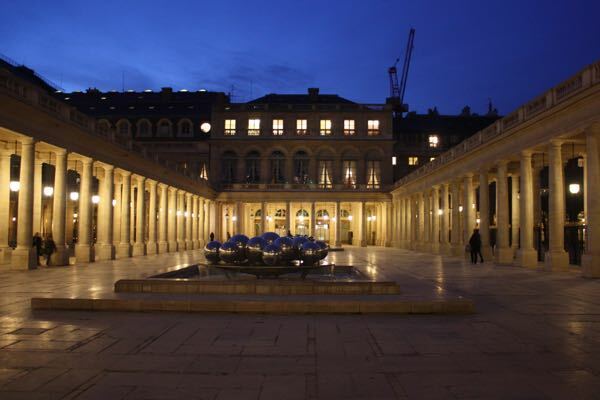 Palais Royal was originally the Palais-Cardinal and the residence of Cardinal Richelieu in the 1600s. 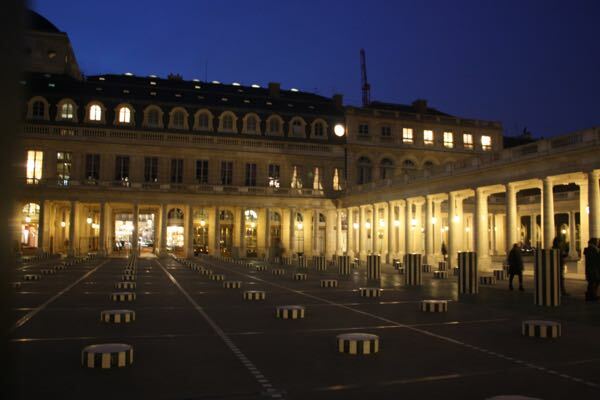 It is located across from the Louvre Museum in the 1st arrondissement and in the larger courtyard (Cour d’Honneur) is art by Daniel Buren called “Les Deux Plateaux”. 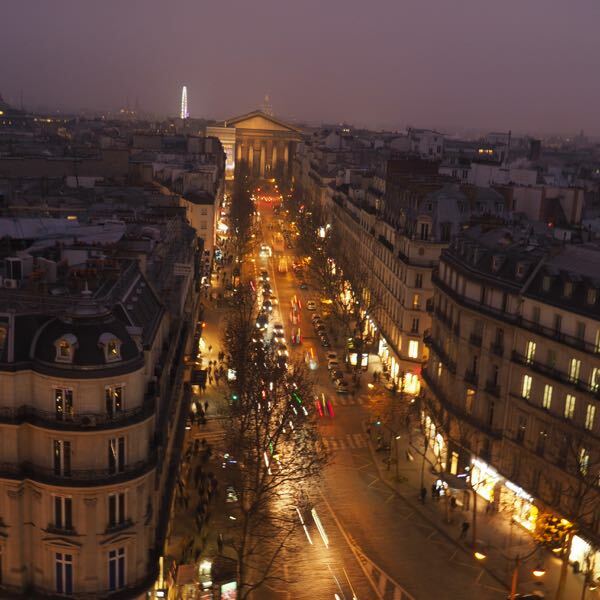 Do you have any favourite places to take pictures of Paris at night? Love the photos. 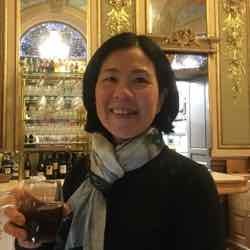 During my last visit to Paris, I remember exploring the city by night and particularly enjoyed walking along the Champs Elysee. It was a memorable experience. There’s a reason they call it “The City of Lights” aside from the whole enlightenment of the 18th century of course! Gorgeous photos you’ve captured. It must be memorable to see Paris all dressed up like that. Thank you. I am so thrilled about the Printemps rooftop photo. Love the colours. Great photos. I particularly like the view of the Seine at night. 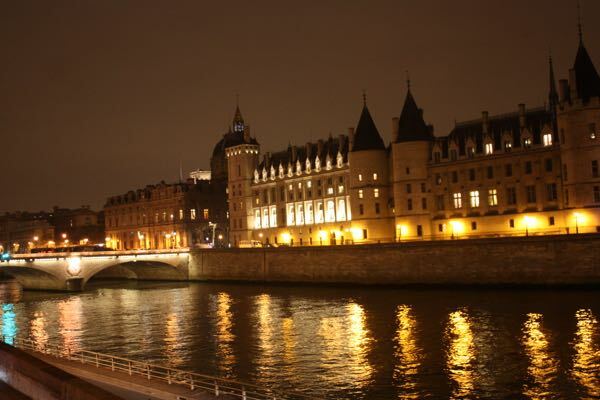 Nothing quite like walking along the Seine…day or night! Paris is one of the most beautiful cities in the world, day or night! Love these night photos. We really enjoyed the night tour we took of Paris. It was a great opportunity for a visitor who doesn’t have as much time to explore as you do to get an overview! And every time I go it’s like the first time. I love it there so much! 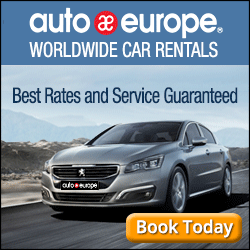 Enjoyed your escorted nighttime tour of Paris. Lovely! Thank you. Nothing like Paris at night! 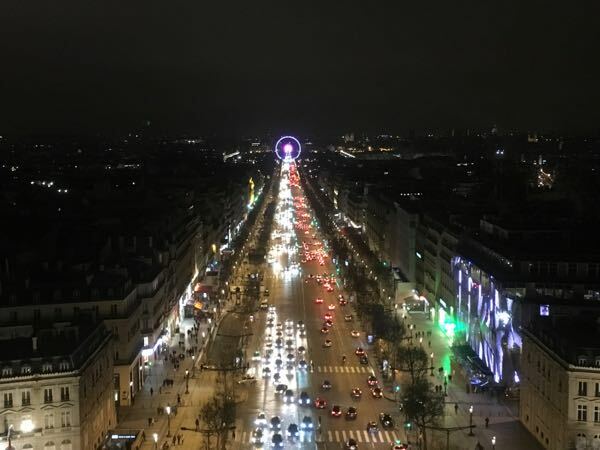 Paris at night is spectacular and your photos certainly do it justice. Love the shots of the Seine. Your photos bring back so many amazing memories for me! Excellent, you covered some wonderful places around the city, I love the first shot above Printemps and what an excellent view, I’ll have to visit there for sunset to evening in the future. I love wandering around Paris at night. My favourite place to take photos is the Pyramid at the Louvre. I haven’t been to Printemps at night so that will be first on my list for the next trip. Thanks for the suggestions. You’ll really like it on top of Printemps. 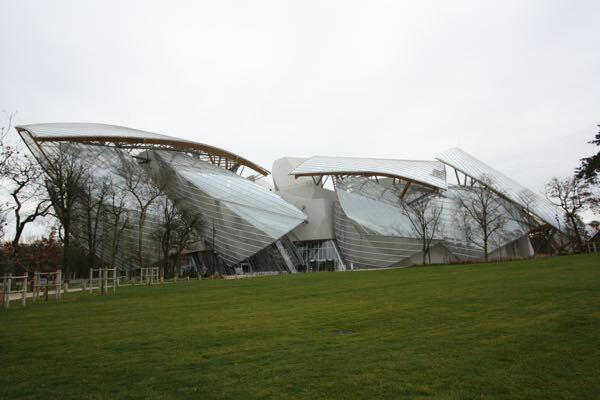 Fantastic insider tips for photo buffs heading to Paris, Janice! Will log this for a future trip! I hope it helps. I’m sure you’ll discover even more “night time” places to get great photos. That looks as amazing place to visit ! Jan you truly captured the City of Light! Outstanding photos – there’s a few spots I’ve only seen during the day. Now I definitely need a trip back to explore more at night. Thank you. I think I might love night time more than day time! I know it’s cliche, but I enjoyed seeing the Eiffel Tower from a distance at night. It was near Christmas, I think, or maybe July 14th; I’m not sure because it was years ago. But they had it all done in blinky lights. Fun! I never get sick of seeing the Eiffel Tower at night, close up or far away. It doesn’t matter. I love it! 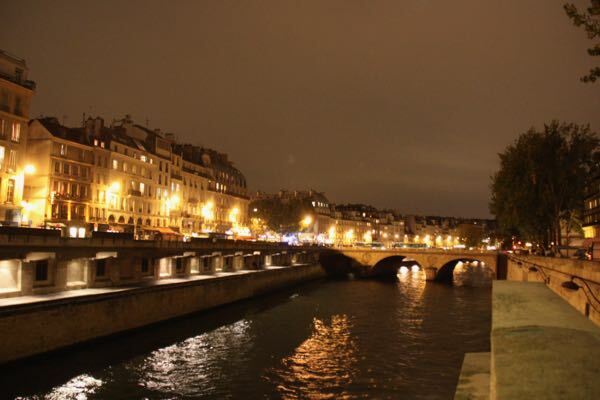 Wonderful night shots of Paris, Jan. Thx so much for sharing. The City of Lights for sure! Thank you for bringing back wonderful memories of Paris by night, it’s such a beautiful city day or night but night time seems to bring out the magic.